The choice of structural design and material is essential in preventing the external walls of a vessel from buckling under pressure. In this revised second edition of Pressure vessels, Carl Ross reviews the problem and uses both theoretical and practical examples to show how it can be solved for different structures. The second edition opens with an overview of the types of vessels under external pressure and materials used for construction. Axisymmetric deformation and different types of instability are discussed in the following chapters, with chapters 5 and 6 covering vibration of pressure vessel shells, both in water and out. Chapters 7 and 8 focus on novel pressure hulls, covering design, vibration and collapse, while chapters 9 and 10 concentrate on the design and non-linear analysis of submarine pressure hulls under external hydrostatic pressure. In chapter 11, the design, structure and materials of deep-diving underwater pressure vessels are discussed, focusing on their application in missile defence systems. Finally, chapter 12 analyses the vibration of a thin-walled shell under external water pressure, using ANSYS technology. 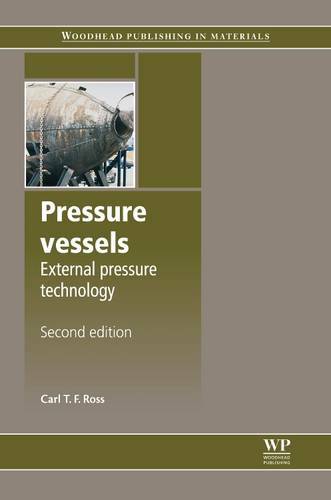 Drawing on the author's extensive experience in engineering and design both in an industrial and academic capacity, the second edition of Pressure vessels is an essential reference for stress analysts, designers, consultants and manufacturers of pressure vessels, as well as all those with an academic research interest in the area.